England started the first day on a defensive mode against the calculated bowling of the five New Zealand bowlers who restricted the hosts to a limited score. England managed 160 at a run rate of 2.00 for the loss of their four main batsmen after consuming 80 overs. The first Test of the two match series commenced on Thursday, May 16, 2013, at Lord’s London. Earlier, Alastair Cook, the skipper of England, won the toss and went into bat along with Nick Compton. The beginning was slow and they scored 24 from the first 10 overs with just 1 four from Cook. Compton was playing a subdued innings and got 16 off 72 balls without any boundary when he was caught by Tim Southee at point off Bruce Martin. The wicket fell at 43 as Jonathan Trott walked in and was dropped at 0 on the first ball of the 25th over. The hosts reached 56 in 29 overs whereas Cook was playing at 30 and Trott was at the other end for 4 runs when the lunch break was taken. Alastair Cook survived a review in the 31st over but was caught behind by BJ Watling off Trent Boult for 32 off 115 balls with just 2 fours. Ian Bell joined in next with Trott who hit his 3rd four in the 37th over and the first tasted a boundary two overs later. The hundred of the innings was displayed on board in the 50th over but the batsmen were unable to pick the run rate. The third wicket partnership enhanced the score to 112 in 53.5 overs as Jonathan Trott was gone for 39 off 96 deliveries with 6 fours. The young gun of England, Joe Root, appeared in the park next as Bell kept on crawling at his end. Root opened his account on the fifth ball with a single and was following the ‘order of the day’ by playing slowly. 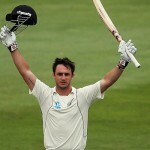 He hit the first four on the 14th ball he faced and Bell scored 20 runs off 75 deliveries at the end of the 61st over. The battery of five bowlers of Black Caps, maintained their line and length throughout the day and the home batsmen were unable to play their shots freely. Ian Bell became the fourth victim at 157 after 78.2 overs when he was dismissed for 31 off 133 with 4 fours. Jonny Bairstow dropped in next as the play was called off because of the bad weather after the last ball of the 80th over was bowled. Joe Root secured his end for 25 off 72 with 3 fours and Jonny Bairstow was at the other side with 3. 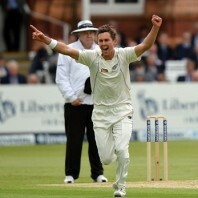 Trent Boult was the top wicket taker with two whereas Neil Wagner and Bruce Martin held one wicket. New Zealand has a psychological edge over England at the end of the first day and a couple of early wickets on day two can bring them to a formidable position.